Water splashes :: Great fun, easy to do at home. Photographing water splashes is great fun! Fine art water splash shots need quite a bit of practice and precise measurements. It is better to get some practice working with water first. Then you will learn about the equipment and working with water. You will also get some great shots. Start off with an easy exercise. The video is going to show you how you can do photos of water tumbling out of a bottle. You get some great results and there is a twist to add a little pizazz. You can show the bottle with the water splashes going upwards! 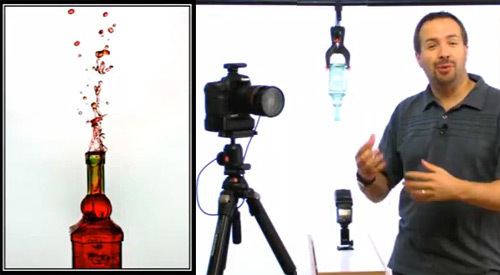 The video will show you how to set up the water splashes shot with a bottle. Here are a few things you need to do for this exercise. In the video Gavin Hoey has some expensive equipment. We can do it using only household items. A water tray – to collect the water splashes coming out. Use a baking tray or large bowl. Use a broom stick or pole to hang the bottle. Put two chairs on a table with the the pole between them Use the backs to hang the bottle. This gives you enough height for the shot at a comfortable level. Use a smallish, thin-necked bottle. Large bottle necks let the water out too quickly. Start looking for the right bottle now. You will have found what you want by the weekend! To suspend a bottle without a studio clamp, tie the bottle around with a length of string long enough to hang it from your pole. Then use some packing tape, or electrical tape to stick down the string tied around the bottle. This stops the bottle from slipping out of the string. This method actually does a better job than shown in the video because the bottle hangs slightly to one side – a pleasing composition. Tape the string onto the bottle near the end of the bottle so your shot captures the top part of the bottle without seeing the tape. If your bottle swings too much while the water is coming out, tie it up using two strings affixed to the bottle. Tie them to the pole wider apart than the width of the bottle and this will stop the swing. In the video Gavin suggests using an off-camera flash. OK, lots of you do not have these. Use the pop-up flash flash on your camera. The problem is that the on-board flash may create a bottle shadow on your background. This is because the flash is in-line with the shot. Notice how the flash is below the bottle in the video. Pull your working table away from the background. Then, well away from the water, point one or two bright domestic lamps at the wall. These will stop shadows and make sure that you have a perfect white background. I usually stand them on the floor behind the table and point them at the wall from there. Apart from these tips the rest of the equipment is much as shown in the video. Cleaning! Don’t we all hate it? Yes, but it can really make a difference to your shots. Make sure you clean your bottle really carefully. Did I mention carefully? One thumb mark, dirty trace or blotch and the beautiful clarity of your shot will be ruined. Wash it in detergent and make sure it is dry (free of drips) before you start. It really makes a difference. Make sure any electrical appliances are well away from any water splashes. Ensure there are no trailing electrical wires near any water or equipment. Have a towel on hand. Mop and dry wet patches on the table and floor as soon as they spill to prevent slipping. Keep your camera and especially any flash equipment away from the water splashes. You don’t want to break your camera or get it wet. Flash guns, even ones with batteries, release very high power jolts of electricity and can be dangerous if wet. With chairs on the table make sure they are safe from falling. This may seem a fun environment for kids… it’s not. Keep them clear. Have fun with the pictures later. Remember, food dye can mark certain clothes, table tops and carpet materials. Keep it clear from these things, wear old clothes. I have found that this bottle exercise can be huge fun. However, it’s also fun to experiment. I have on occasion placed various items under the falling water. Place them within the range of your shot frame. It takes a little lining up. Fun things like brightly coloured objects work well. Try grapefruit, lemon, bright colour balloons a bath duck and so on… Make sure you have something large enough to catch the water splashes. This makes way-more mess over a larger area! If you want to make it really fun you can do the water splashes falling on someone’s head. Yeeha! Have fun with your water splashes. With only a few tries you can get some great results and have some excellent shots to show your friends. This entry was posted in Equipment, How to..., Light and Lighting, Photography, Things to try, Tips Tutorials & Techniques, Video included and tagged Bottle, Buying equipment, Creativity, Depth of Field, Droplets, exposure, Flash, Food dye, Splash, Tripod, Video, Water, Water photography. Bookmark the permalink. I am going to have to give this a serious attempt. I never even knew there was such a thing as “liquid art.” Thanks for the tips. Great, it is wonderful fun and you can get some great results. Try the other link too. http://www.photokonnexion.com/?p=8478 :: Bubble photography. That is also great fun. Enjoy!